Step 1: Salt your pasta water GENEROUSLY. Before you put any pasta in it, the water should taste like the ocean. Just throw a small handful of kosher salt in there. But not too small — noodles absorb the water they're being cooked in, so this is the best way to season them. Otherwise they're just taking in tasteless water. Step 2: Don't overcook the noodles. You can get a loose sense of how long they should cook from the directions on the package. But if you plan to bake the mac 'n' cheese — which is necessary to achieve any kind of crispy topping — don't boil them all the way until tender. Instead, take them out a minute or two early while they are still toothsome. Step 3: Make a real sauce. This is the most important part (aside from salting the pasta water). Good mac 'n' cheese doesn't come from shredding a bunch of cheese onto cooked pasta. You're going to fold that pasta into a silky cheesy sauce. 3. 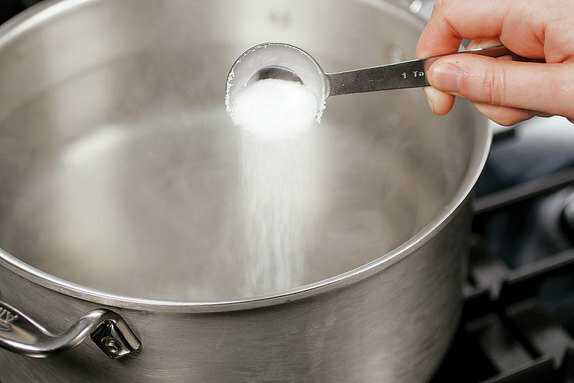 Whisk to combine and cook for a few minutes so that flour doesn't taste raw. Now you've got what is called a "roux" — equal parts butter and flour cooked together. 4. Add around 2.5 cups of milk or cream and whisk again. Watch it thicken and magically turn into sauce. Step 4: Add spices and seasoning (this step's optional). This is an optional step, but a lot of people swear by adding a teaspoon of dried mustard at this point. You could also add cayenne for kick, paprika, onion powder, garlic powder, and/or Worcestershire sauce. Don't go overboard, but play around with what you like. Step 5: Temper egg yolks into the sauce (definitely optional). OK, this sounds hard, but it's not. Adding egg to the sauce will make it delicious, but you can't just throw a whisked egg yolk into a hot sauce or it will scramble. So you have to temper it. These great instructional images also come from Pioneer Woman's recipe. 1. Separate the eggs from the whites. Just use your hands, you don't need some crazy plastic bottle trick. 2. 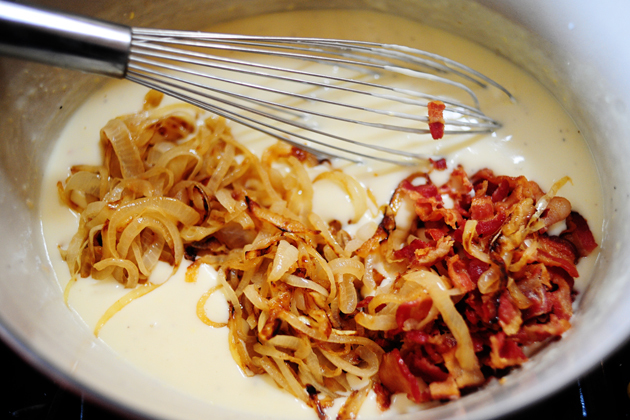 Take a little of your hot bechamel and put it into a bowl of whisked egg. 3. Whisk so that the egg heats up gently. 4. Then dump the warm egg/bechamel mixture into the hot pot of bechamel, and whisk. Step 6: Add CHEEEEEESE (not optional). But also: Go WILD with the cheese varieties. Once it's time to add cheese, mix it up. Try a hodgepodge of grated Gruyère, Brie, Comté, fontina, mozzarella, Feta, sharp cheddar. Basically, anything! If you'd like to follow a recipe using multiple cheeses, try Bon Appetit's Cheesemonger's Mac and Cheese or Saveur's Artisanal Macaroni and Cheese. Step 7: Now, really just add whatever you want. Cooked bacon and caramelized onions like Pioneer Woman's Fancy Macaroni. Maybe you want to mix in some chili. Step 8: Now combine your sauce with the pasta. Step 9: Put it in a thing that'll go in your oven. A cast-iron skillet, a casserole dish, a baking sheet — it honestly doesn't matter, as long as it can go in the oven. One thing to keep in mind with the vessel is exposed surface area. For example, food52's baking sheet mac 'n' cheese recipe technique will give you a bigger crunchy topping to soft ratio. Step 10: Next step is toppings. Good macaroni and cheese has cheese on top too. For extra crunch you might use a combination that includes Parmesan. Your options here are vast: regular breadcrumbs, sourdough bread chunks, panko breadcrumbs, ritz cracker breadcrumbs, ground up nachos. Go nuts. Step 11: Sprinkle the crumbs on top then put it in a 375F oven for 20-25 minutes. You'll know it's ready when it's bubbly, golden, smells amazing, and looks gorgeous. Once you've mastered basic mac 'n' cheese, there's lots of fun to have. Make fried nuggets of mac 'n' cheese. Get the recipe at yummly. Enjoy it even if you're gluten-free.